Smith was waived by the Giants on Wednesday, Dan Salomone of the team's official site reports. Analysis: Smith's value in the Big Apple took a hit when the team opted to bring on Elijhaa Penny to help out at the fullback position. As a rookie last season, Smith appeared in 11 games for the Giants. Smith recorded five tackles (four solo) in 11 games with the Giants in 2017. 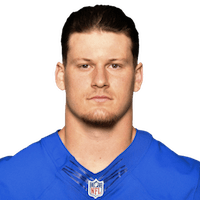 Analysis: Smith is officially considered a fullback/tight end, but played only 50 offensive snaps this season, compared to 194 on special teams. Even with increased offensive snaps next season, the 24-year-old is unlikely to provide consistent offensive production with zero carries or receptions in his rookie season. Smith signed a contract with the Giants on Saturday. Analysis: Smith cracked the Giants' 53-man roster to start the season prior to being waived in late September. The 24-year-old did not accumulate any stats during his three games with the team, and isn't expected to be a source of offensive production. 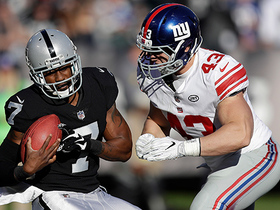 New York Giants linebacker Shane Smith bull rushes Oakland Raiders punter Marquette King before he could kick the punt.